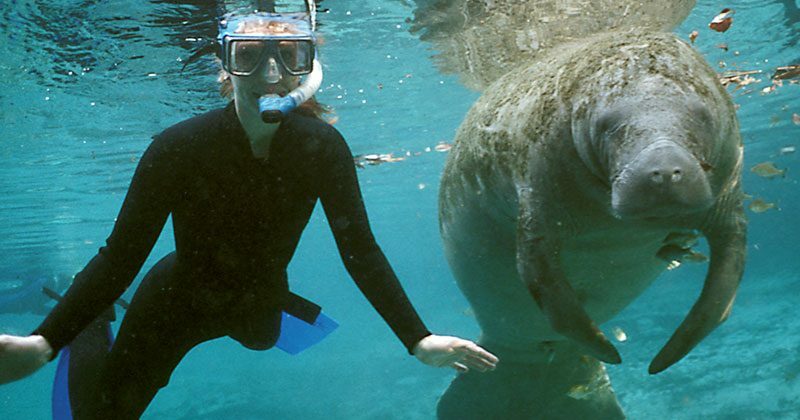 Manatees have been a part of Florida culture and folklore since before European settlers landed on her shores. In 1492, Christopher Columbus recorded the first known written mention of a manatee in North America, mistaking the gentle giant for a mermaid. This was a common enough mistake for seafarers that the scientific name for manatees is Sirenia, a name reminiscent of mythical mermaids. Unlike their mythical mistaken identity as a siren of the sea, manatees are now frequently called sea cows instead due to their large size and slow pace as they patiently graze the day away. Although the marine herbivore may seem close in nature to cows, the mammals are in fact much more closely related to elephants. Surprisingly, both of the giants evolved from a common group of small, rodent-like, hooved animals and do not share a common ancestor with other marine mammals like whales, dolphins or seals. Manatees are found throughout Florida’s waters but prefer warmer water temperatures which drives them in land during the chilly winter months. Freshwater springs in Crystal River, fed by the Florida aquifer, provide a constant temperature of 72 to 74 degrees and the perfect natural sheltering choice for manatees looking to escape the cold. Even in the summer month, however, there will be hundreds of manatees enjoying the temperate waters, giving adventurers the perfect opportunity to see them up close. 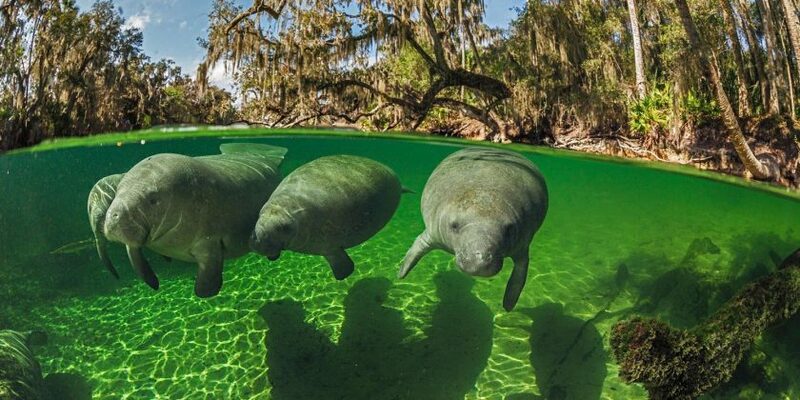 Crystal River is called the Manatee Capital of the World as it was the first place in Florida to offer programs to give visitors the chance to swim with the endangered giants. In fact, the only place that you are legally allowed to get in and swim with them is in Citrus County. 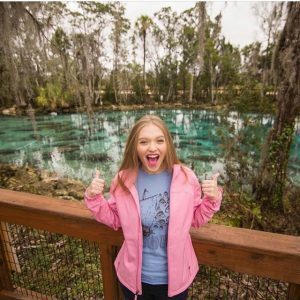 In addition to swimming, there are options for everyone to see the manatees in their natural environment including kayaking or walking the boardwalks of Three Sisters Springs. Manatees are the most active in the mornings and tend to spend most of their afternoon sleeping so plan your adventure for early in the day. Photo credit Three Sisters Springs Facebook. If staying on land is your preference, the boardwalk at Three Sisters is a fabulous viewing spot. Unfortunately, there is no parking so you have to walk in or take the trolley. For more information call 352.586.1170 or go to threesisterspringsvisitor.org to purchase tickets. If swimming with the manatees is on your bucketlist, it is technically legal to do so on your own but you most likely won’t know the best spots or have the equipment to do so. The US Fish and Wildlife Service has a list of local Crystal River businesses that provide tours and equipment rentals. As manatees are endangered, visitors are encouraged to practice what’s called “passive observation” and there is an extensive list of rules when approaching the creatures. 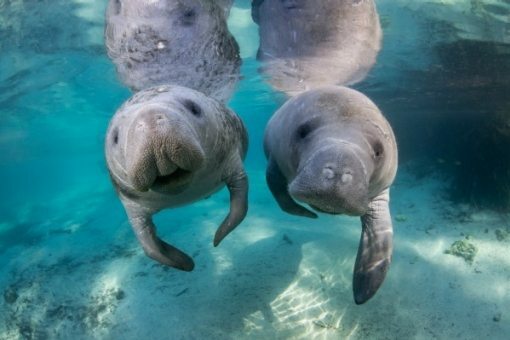 The US Fish and Wildlife Service has Manatee Manners videos (listed below) to educate swimmers, boaters and paddlers on the prohibited behaviors when interacting with manatees.